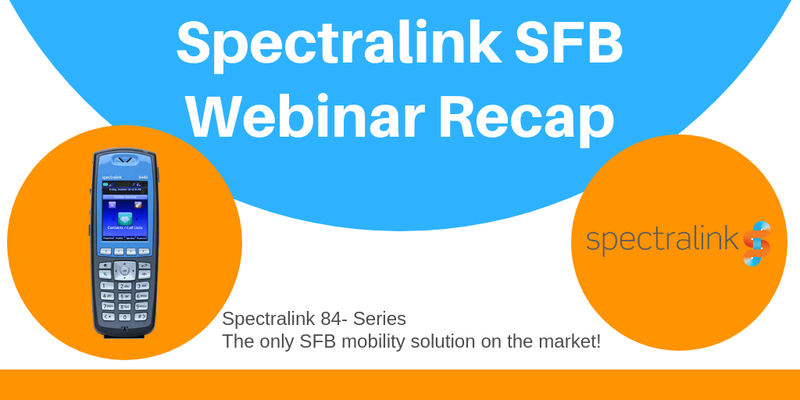 Did you miss our Spectralink mobile solutions webinar this week? No worries! Download our presentation slides below and check out the Q&A session to review! Q1: We are setting up the wireless access points (APs) at our facility, how do I know what devices work best? Is there a compatibility list? Answer: We recommend you check the VIEW (Voice Interoperability for Enterprise Wireless) Program. VIEW Certification provides customers with proven Wi-Fi telephony solutions using enterprise-class WLAN infrastructure products and Spectralink’s 8000 handsets. Learn more here. Q2: What features support device sharing among coworkers? Answer: If you are using the Skype for Business environment, you can just use Pin Authentication feature on the 8400 for device sharing. When you are logged in, it becomes your device. When you are logged out then somebody else can potentially log in to that phone and use it as their phone as well. When it’s not in the Skype for Business environment, the phone does support the user support functionality where you can actually log in your user profile to the phone and that user profile will contain things like your contact directory and other specific information. For the and PIVOT handsets, there are EMM applications and Android specific functions that allow you to handle device sharing. Q3: Do you have any case studies or any training towards educational type end users? Answer: Yes, there are applications and use cases for the Education institutions. We offer a full suite of training on the Spectralink devices and management system and platforms. Q4: What is the process like for larger plans building appointment, do you have on-site service? What does it look like normally? Answer:We offer a full suite of professional services including remote and onsite designs. We do device validation as well to make sure it’s accurate or if there are any adjustments needed to be made. We also have design consultation and other services.